This question came to me from a small gnome named Troilus. I met her long ago squatting in an abandoned oil tanker outside of Marrakesh and she send me this question via carrier pigeon as she is without any devices except a Soviet era Hamm Radio in which a mole is nesting. She say she was hearing this name, “Tim Tebow” very oft on her frequencies and she wishes me, great zamboni to explain this to her. “Is this a new President of United States, or new Pope, or big hurricane like Katrina?” she ask me in her note. I will also explain this to you my readers, as my research shows that most of you are so highly decorted with sophistic degrees and NPR as to maybe know very little about Football and this pop phenomenon of Tim Tebow. Tim Tebow is a great quarterback who people love to hate. The hate and laughter he gets are for these reasons: He throws funny. He believes in God and himself very much. Despite imperfect statistics, he usually wins. This last season he sits on bench for first five games because his coaches don’t like him. His team loses again and again… the fans keep chanting, “tebow! tebow!” Finally they put him in and win seven straight games. Now maybe they go to Superbowl. The wins are not pretty and much of the time Tebow is running like big jackal holding a sick baby down the field or they are losing the game until the last few seconds- but like the old Bulgarian pole vaulter Shminsky Shminsky used to tell me, “I can win with a broken foot if the other guy has a broken leg.” Ya! That’s it. Now, in the larger sense, a Tebow, as the question asks, is someone that shouldn’t be as good as they are, and makes people mad for it. George Bush was Tebow. On paper he should have been a train wreck, but he believed in his destiny so we had decade of “War on Terror,” and “No child left a dime”. Oy. Henry Thoreau was Tebow. “Hey look at that freak in the cabin, ha ha!” Everyone else wanted to sit on couches. He gave us Walden. Steve Jobs, definitely a Tebow. College dropout. Believer, patient. Made that weird “next” computer no one bought. Margaret Thatcher was Tebow too. See the movie. 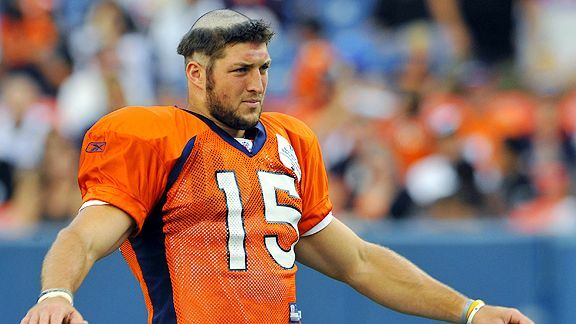 As the picture below shows, Tebow is okay with being a fool in others’ eyes. (Rookie hazing led to this coiff, though I sported this look all through college and the chicks love!) Like it or not, he answers to higher power, and seems to attribute both the good and bad to it, or to “Him”. The irony in all this is that now people look at Tebow himself like a god, in joking they say “Praise Tebow” or “Tebow for president.” So this is really what a Tebow is: our need for a hero, our need to believe in something. It is also lots of hard work, never being comfortable.Tebow is bigger than Tebow, and he believes in something Big. He believes there is a reason for Tebow. What is reason for you?